Raw food might seem like an off-and-on again trend, but there are some standby dishes that stand the test of time. Carpaccio, which began as a raw meat preparation, now encompasses a number of specially prepared ingredients, combining rich flavor and texture to awaken your appetite. 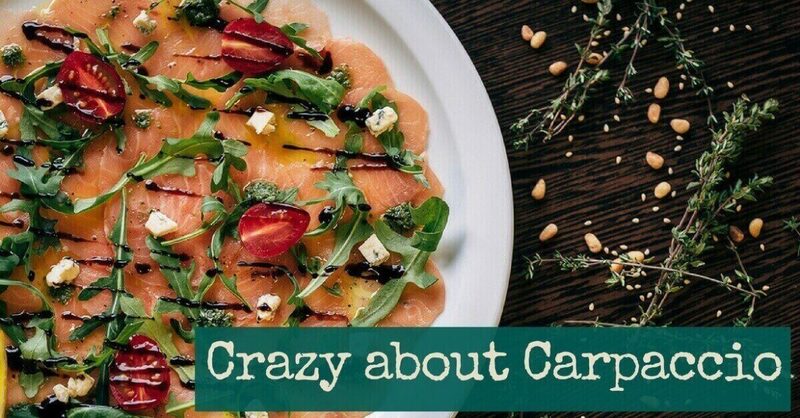 If you haven’t heard of carpaccio, read on to learn more about this now-classic Italian antipasti dish. Carpaccio as we know it today was invented in the 1950s by a restauranteur in Venice named Giuseppe Cipriani. At his restaurant, Harry’s Bar, Cipriani created carpaccio of beef for the Countess Amalia Nani Mocenigo, whose doctor recommended she avoid cooked meats. Cipriani based his creation on a specialty from the Piedmont region, known as carne cruda all’abese. And how does this relate to the visual arts? Well, here’s a fun fact: this mouth-watering dish for meat-lovers was named after the Venetian painter, Vittore Carpaccio (circa 1465-1525). The unforgettable whites and reds in his paintings were on Cipriani’s mind when he was thinking up a name for his newly-invented beef preparation. You may be wondering if there are similarities between carpaccio and tartare. While carpaccio is sliced, tartare is finely chopped or minced. The seasonings that dress up tartare often include mayonnaise, capers, onions, ground pepper, raw egg yolk, and Worcestershire sauce. Cipriani may have been inspired by tartare, however, when he created carpaccio! Tartare’s roots are found in the 19th century. Cipriani’s original carpaccio recipe, which was published in a cookbook from Harry’s Bar, includes five ingredients: beef, mayonnaise, Worcestershire sauce, lemon juice, and milk (with salt and pepper to taste). Carpaccio represents the best elements of Italian cuisine: fresh preparation, incredible texture, and bright flavors. From the smoothness of the olive oil to the tender cut of meat, to the briny salty flavor of capers to the bright splash of lemon, carpaccio is a simple yet elegant way to begin a meal. At the center of carpaccio is some form of protein (or in certain preparations, a main fruit or vegetable such as beets or pear). In the traditional preparation, a well-sourced, high-quality tender cut of beef is used. Fish or other seafood may also be used in carpaccio. The beef (or seafood) is sliced into incredibly thin, almost translucent slices. The protein is always fresh – it should never be frozen and then defrosted. Arugula, radicchio, endive, and watercress are greens that traditionally accompany carpaccio. Arugula is the most common, bringing a desired peppery kick to the dish. In some preparations, the addition of chives brings another level of fresh green to the dish. Lemon is a major player in carpaccio, freshly-squeezed to season the meat. Parmesan’s trademark umami flavor adds another layer of mouth-watering richness to the meat. Sometimes, white truffle replaces Parmesan for a very-gourmet preparation. If you’re new to eating raw meat, never fear. Across the globe, many cuisines offer some form of raw meat cured with an acidic element – think ceviche, in which raw seafood is treated with the acid of lime juice, or poke, a Hawaiian preparation of cubed raw fish served with soy sauce, sesame oil, onions, and avocado. And of course, we’re all familiar with sushi and sashimi. Here at Cucina Toscana, we serve several forms of carpaccio, including vegetarian ones. Our carpaccio di bue is served in the traditional Venetian style, consisting of beef, arugula, lemon, olive oil, and Parmesan. We also offer seafood carpaccio: our salmone carpaccio boasts a smoked salmon and fennel, while our carpaccio di tonno takes a creative spin with fresh mozzarella, ricotta mousse, tomato-lemon dressing, and avocado. Our aragosta granchio in carpaccio features fresh lobster and crab. Vegetarians will enjoy our barbabietole carpaccio – a bright array of roasted purple and golden beats, served with pear, avocado, and honey. Begin your next meal with one (or more) of our carpaccio preparations! Make your reservations with us at Cucina Toscana today.